Tokyo (CNN) -- Reactors at two Japanese power plants can no longer cool radioactive substances, a government official said Saturday, adding that a small leak had been detected at one of the facilities. Atomic material has seeped out of one of the Fukushima Daiichi plant's five nuclear reactors, about 160 miles (260 kilometers) north of Tokyo, said Kazuo Kodama, a spokesman for Japan's nuclear regulatory agency. Potentially dangerous problems in cooling radioactive material appear to have cropped up there, as well as at another of the Tokyo Electric Power Co. nuclear plants, Ichiro Fujisaki, Japan's ambassador to the United States, confirmed to CNN. The Fukushima Daini and Fukushima Daiichi power plants are separate facilities located in different towns in northeastern Japan's Fukushima prefecture. Each one has its own set of individual nuclear reactors. Kodama said the cooling system had failed at three of the four such units of the Daini plant. Temperatures of the coolant water in that plant's reactors soared to above 100 degrees Celsius (212 degrees Fahrenheit), Japan's Kyodo News Agency reported, an indication that the cooling system wasn't working. Authorities subsequently ordered residents within 3 kilometers of that facility to evacuate as "a precaution," Fujisaki said. That plant was also added to the Japanese nuclear agency's emergency list, along with the Daiichi plant. The news agency also reported Saturday that Japan's nuclear safety agency ordered the power company to open release valves in that plant, as well as the other Daiichi plant's "No. 1" reactor. Tom Cochran, a senior scientist with the National Resource Defense Council, explained that this was likely done to release growing pressure inside both atomic plants. High temperatures had caused the water, meant to cool the radioactive material, to boil and thus produce excess steam. This comes amid Kyodo's reports, citing the same Japanese agency, that radiation levels were 1,000 times above normal in the the control room of the "No. 1" reactor at one of the facilities. These and other issues caused by the 8.9-magnitude quake prompted authorities to order an evacuation of people within 2 to 3 kilometers (1.2 to 1.8 miles) of the plant, a move Edano called "precautionary." Early Saturday morning, Prime Minister Naoto Kan said that the evacuation order had been extended to affect those within 10 kilometers of the reactor. Kan spoke to reporters shortly before flying to the quake-ravaged region with nuclear safety authorities -- including going over the Daiichi facility -- according to Fujisaki. The evacuations notwithstanding, the nuclear safety agency asserted Saturday that the radiation at the plants did not pose an immediate threat to nearby residents' health, the Kyodo report said. These developments come a day after the quake ravaged the Asian nation, shutting down power to more than 1.2 million people and stoking fears of a crisis at the nation's atomic plants. Most of the concern initially had centered around the first Daiichi plant, which Chief Cabinet Secretary Yukio Edano told reporters on Friday "remains at a high temperature" because it "cannot cool down." That plant and three others were shut down after the quake hit around 2:46 p.m. Friday local time, prompting authorities in Tokyo to declare a state of atomic power emergency. Three of the Daiichi reactor's six units shut down because of the earthquake, while operations at the other three were out due to "regular inspection," the Tokyo Electric Power Co. said in a news release Saturday. Fire broke out at a third facility, the Onagawa plant. But crews put it out, according to the International Atomic Energy Agency. 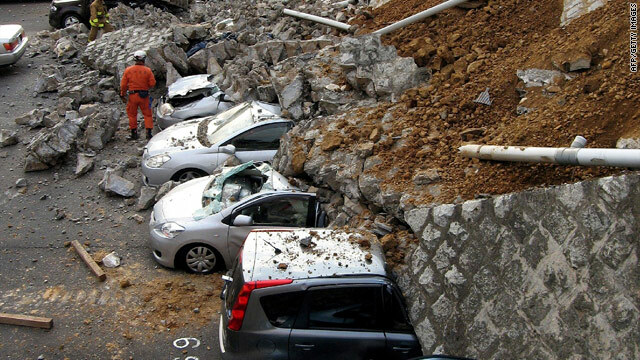 Many hours later, shortly before 4 a.m. Saturday, a 6.6-magnitude aftershock struck near Nagano Prefecture on the west coast of the Japanese island of Honshu. Afterward, Kyodo reported that the nearby Kashiwazaki-Kariwa nuclear reactor continued to operate as normal. That quake was one of at least seven measuring magnitude 5.2 or stronger after the main quake, the U.S. Geological Survey said. The trouble the Daiichi plant happened after its once operating reactors had been successfully shut down, Edano said. Cham Dallas, a professor of disaster management at the University of Georgia, said that it wouldn't be surprising if reactors get "both thermally hot and radioactively hot" after the reactors were shut down. "When they shut down reactors, it takes a long time for them to go down," Dallas said. "It does not necessarily mean radioactive material got out of the reactor." The International Atomic Energy Agency said Friday on its website that the quake and tsunami knocked out the reactor's off-site power source, which is used to cool down the radioactive material inside. Then, the tsunami waves disabled the backup source -- diesel generators -- and authorities were working to get these operating. Janie Eudy told CNN that her 52-year-old husband, Joe, was working at the plant and was injured by falling and shattering glass when the quake struck. As he and others were planning to evacuate, at their managers' orders, the tsunami waves struck and washed buildings from the nearby town past the plant. "To me, it sounded like hell on earth," she said, adding her husband -- a native of Pineville, Louisiana -- ultimately escaped. Eighty employees of General Electric Hitachi Nuclear Energy, including Eudy, who were at the plant are all safe, company spokesman Michael Tetuan said. He added that the firm is devising plans to evacuate those workers, who were subcontractors at the plant. The IAEA, the international nuclear organization, said Friday that its officials are "in full response mode," as they worked with Japanese authorities and monitor the situation. Using Air Force planes, the U.S. government has sent over coolant for the plants, Secretary of State Hillary Clinton said Friday. "We're really deeply involved in trying to do as much as we can on behalf of the Japanese and on behalf of U.S. citizens," she said. The Tokyo Electric Power Co. said that seven thermal power stations and 24 hydro power stations that it operates also also have been shut down. The Goi Thermal Power Station has since been restarted, as have hydro power stations in Niigata prefecture, the company said. All these shutdowns had left more than 1.2 million people without power as of Saturday morning, according to the electric company. James Acton, a physicist who examined the Kashiwazaki-Kariwa plant after a 2007 earthquake, told CNN that releasing the valves from the two power plants might only spew a relatively small amount of radioactive material into the atmosphere. A greater concern would happen if -- after what Cochran estimated would occur if temperatures topped 540 degrees Celsius (1,000 Fahrenheit) -- the fuel rods inside the reactors melted down. "The big problem is if it can't cool and the (reactors') core starts to melt -- then you have the possibility of a greater release of radioactivity into the environment," Acton said. If that happens, "there's a possibility of cancer in the long term -- that's the main hazard here." CNN's Tom Watkins and Greg Botelho contributed to this report.